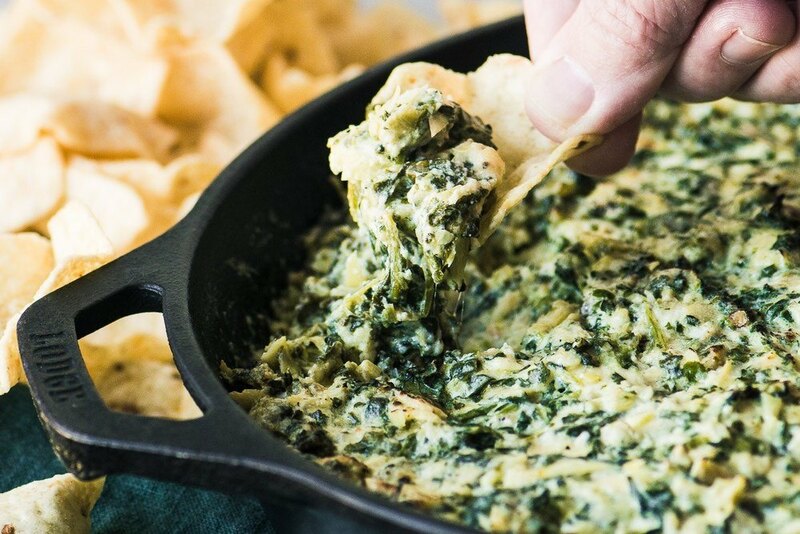 Smokey Spinach Artichoke Dip ~ my cheesy classic hot dip recipe takes a fan favorite appetizer and gives it a twist with smoked mozzarella and gouda cheese. Add the artichokes to the bowl of a food processor. Make sure to drain off any excess liquid. Put the spinach in a colander or mesh strainer and press firmly with the back of a large spoon to remove any excess moisture. Add it to the processor along with the garlic, cheeses, mayonnaise, and sour cream. Pulse, scraping down the sides of the bowl if necessary, until everything is uniformly processed to a slightly chunky texture. Season the mixture to taste with the salt, pepper, and lemon juice. Spread into an oval baking dish such as a gratin dish, or a 10 inch cast iron skillet. Bake for about 45-50 minutes, until hot through, bubbly, and beginning to brown on top. Serve immediately with chips or a thinly sliced baguette. To roast garlic, take a whole bulb and slice the tip end off, just to expose the cloves. Put it on a piece of foil, drizzle it liberally with olive oil, and loosely wrap it with the foil, leaving the top open. Roast in a 350F oven for about 45-50 minutes, or until soft and golden. When cool enough to handle, squeeze out the cloves from their skins.